I've long wondered why it was so hard to find a nice Chromebook. Sure, the Pixel may be an exemplary laptop, but it's near-impossible to recommend that anyone spend $1,000 on a Chrome OS device. But most cheaper Chromebooks compromise your computing experience with bad displays, uninspired hardware or internals that just can't keep up. But there's change in the air. Last year, Toshiba and Samsung both released 13-inch models that both moved the bar forward, but they also each had some serious flaws. Now Dell is trying its hand with its first 13-inch Chromebook, a follow-up to the successful 11-inch version it released last year. It may be marketed toward business users, but in a lot of ways this is a Chromebook that anyone who believes in the promise of Chrome OS could love. 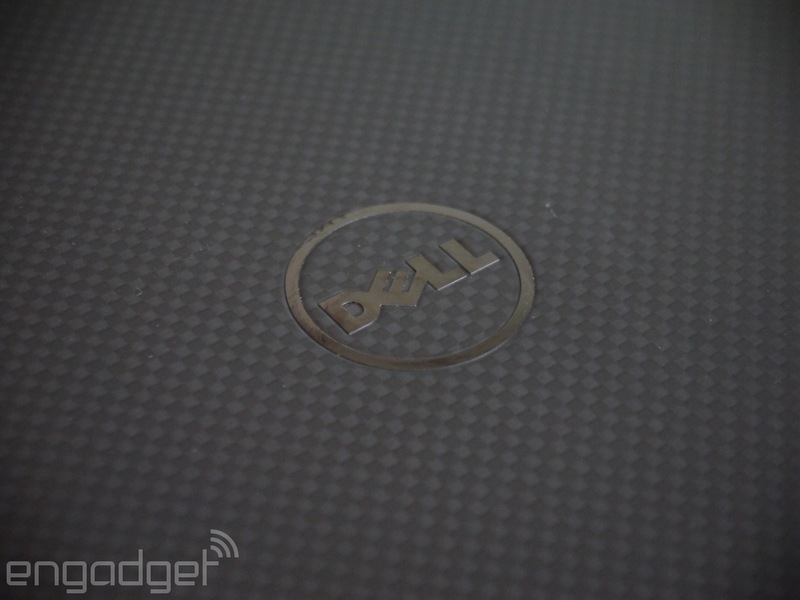 That quality comes at a cost, though: The entry price for Dell's Chromebook 13 is $429. Does this Chromebook justify that bigger investment? Dell's Chromebook 13 costs a little more than the competition, but for that extra money, you get: hardware that feels like it's from a much more expensive machine, excellent performance, fantastic battery life and one of the best screens you'll find on any Chromebook. 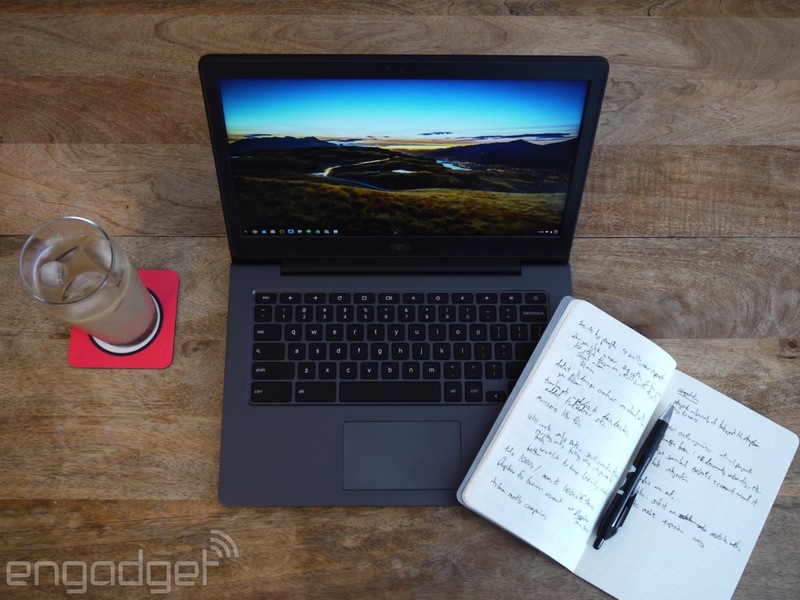 If you're a fan of Google's Chrome OS, you should absolutely give this laptop a look. From the outside, the Chromebook 13 follows the demure styling found in the Dell Chromebook 11 -- there's nary a hint of color here outside of the Chrome logo on the lid. It might not be the most innovative or attractive laptop out there, but it's functional and attractive in the same way as a navy blazer -- it'll never go out of style. The gunmetal gray magnesium alloy chassis, carbon fiber weave on the lid and shiny black Dell logo are all subtle and appropriate for the computer's business pedigree and also appear to be highly influenced by the well-designed XPS series. It's not something any employee (or consumer) will really be able to complain about. That no-nonsense design extends to how the computer feels in your hands and in use. It's a little thick (0.84 inch at its largest point) and a little heavy (3.23 pounds), but it at least feels strong and not cheaply built. Unlike most Chromebooks, there's no flex when you're typing or carrying the device around. It's one of the best-designed Chrome OS laptops I've used, drawing a lot of influence from the Pixel -- and it should at this price. It's clear that Dell is leveraging a lot of its know-how from other notebooks in its lineup, and as such, this computer feels like a solid, time-tested design, not a first version of a new product for the company. As far as I'm concerned, a Chromebook (or any laptop, really) has to get the keyboard, trackpad and screen right (which is why I've been so disappointed with the terrible 1,366 x 768 panels that populate most Chromebooks). Fortunately, the Dell succeeds on all counts here. The 13-inch, 1080p display is a standout -- while Dell says it's an IPS screen, viewing angles aren't quite as good as you'll see on more expensive computers. But it's otherwise a wonderful-looking screen that finally offers up a decent-size workspace on a Chromebook. Sure, 1080p can make text a little tiny, but fortunately you can step it down to 1,536 x 840 if you need things to be larger. (Oddly enough, this panel can also be set to a higher, 2,400 x 1,350 resolution, but I wouldn't recommend it.) Everything's much sharper at 1080p, and the small text generally wasn't a problem for me. I was happy to use this screen for hours every day during my testing. The backlit keyboard isn't as good as the one on the Pixel, but it's far ahead of just about every other Chromebook I've used, with great travel and key caps that never feel like they're going to go flying off if I type too vigorously. In fact, it's as good as a keyboard on a laptop that costs twice as much. 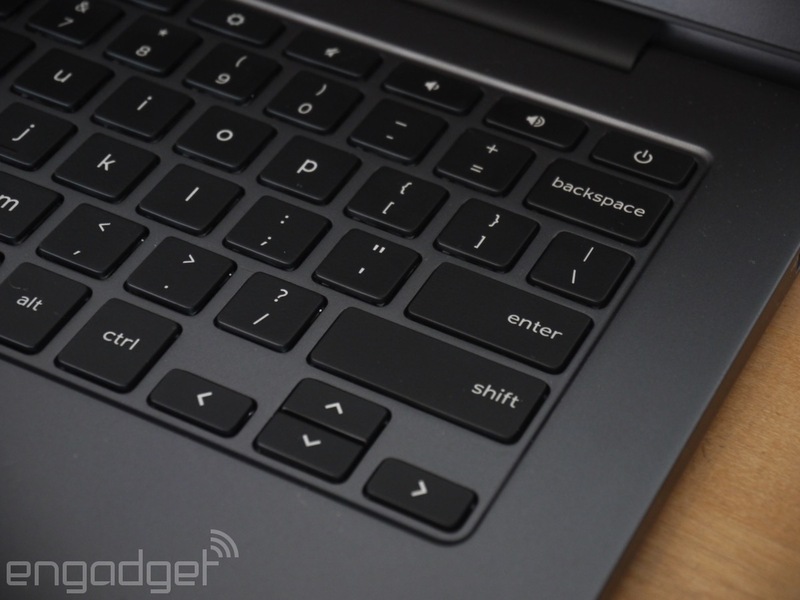 The trackpad is also a pleasure: It's highly responsive and supports multitouch gestures. Again, it just felt like a component from a more expensive computer. I wish it were a bit bigger, but that's the only knock I have. One surprising thing about the Chromebook 13's hardware is its robust audio output. Sure, you're still listening to music on a laptop, but my casual testing revealed a computer that had solid speakers. It's not as good as the Skullcandy setup on Toshiba's Chromebook 2, but it's better than I expected and certainly good enough for music or video playback in a pinch. Listening to music over headphones sounded similarly clean, with no distortion and clear playback at both high and low volumes. As for ports, the Chromebook 13 gives you the essentials, but not much else; here are two USB ports (one 2.0 and one 3.0), an HDMI connection, a headphone jack and a microSD slot. The latter is probably my biggest issue with the laptop's hardware: This computer feels big enough that having a full-sized SD slot on board shouldn't have been a problem. Not having one means you'll likely need a cable or adapter to get photos off a digital camera, which is a bummer. There's also a 720p camera for video calls that does its job, but is otherwise unspectacular. Dell is offering a wide variety of hardware configurations for its Chromebook 13. The $429 base model currently for sale (which I tested) features a Celeron 3205U processor along with 4GB of RAM, a 16GB solid-state drive and that 1080p non-touch display. (There's also a $399 model with only 2GB of RAM; it's not on sale yet and we do not recommend buying any computer with that little memory.) You can bump the processor up to a Core i3 or i5, increase storage to 32GB, jam in 8GB of RAM or get a model with a touchscreen. But for most customers, the low-end model will probably be enough for their needs -- Dell's base 13-inch Chromebook is a solid performer that outdoes just about all its competition. Intel's newer Celeron 3205U processor appears to be a big step up over the N2840 model used in last year's Toshiba Chromebook 2, although it's not as big a step up over the Celeron 2955U chip used in the Acer C720 and Dell's own 11-inch model. But the only Chromebook we've tested that definitively outperforms Dell's new model is the Pixel. It wasn't just in these benchmarks, either -- the Chromebook 13 rarely slowed down at all, no matter how many tabs I had open. I'd typically have instances of Tweetdeck, Slack, Simplenote and Google Play Music or Spotify running alongside at least two more Chrome windows full of tabs and things ran smoothly nearly all the time. If I really pushed the number of tabs, I could cause music playback to start stuttering a bit, but in my normal usage scenarios, the Chromebook 13 ran admirably. That excellence extended to the battery life. If I brought this computer fully charged to the office and forgot the power cable, I would not even break a sweat. As I write this review, the Chromebook 13 has been off the charger for over seven hours -- and the computer still has 33 percent of its battery life left. That's simply excellent, and results when running our battery test (looping HD video playback with screen brightness set to 65 percent) were similarly strong. Dell's Chromebook 13 lasted 10 hours and 25 minutes during our test. This laptop also charges particularly fast -- plugging it in completely dead for 30 minutes got me up to 35 percent, which is good for over three hours of work according to the battery life indicator. And it only took about 90 minutes to charge it completely. Of course, none of this matters if you can't live your computing life in Chrome OS. If you haven't checked it out lately, it's a much more mature OS than it was a couple years ago. Almost every part of my daily workflow functions perfectly well in Chrome. Slack, Tweetdeck, Simplenote, Dropbox and Wunderlist all run as well as browser tabs as they do on my Mac; Spotify's web player has improved a lot over the last year; and, obviously, all Google apps and services work like a charm. With more and more software moving online, the case against a Chromebook is harder to make these days. Even the Office documents I have stored in my Dropbox are easy enough to edit: I can access them through the Dropbox web interface, open them in Office Online with one click, make my edits, save them and exit right back to Dropbox. It's a surprisingly efficient workflow that makes having a full Office install basically unnecessary for me. Yes, there will always be people who need more full desktop-class apps, but nearly everything seems to be moving online right now -- even Photoshop will work on Chromebooks soon enough. You should still carefully consider what you need your computer to do before buying a Chrome device, but I'm finding more and more apps every year that let me accomplish nearly everything I want to do with a Chromebook. Photo editing does remain a big problem -- Google Photos is a wonderful place to back up, view, share and make minor tweaks to your pictures, something that'll be enough for most people. But when it came time to process the photos for this review, I went right back to my Mac. Sooner or later, I'm sure this issue will be solved, but we're not there quite yet. 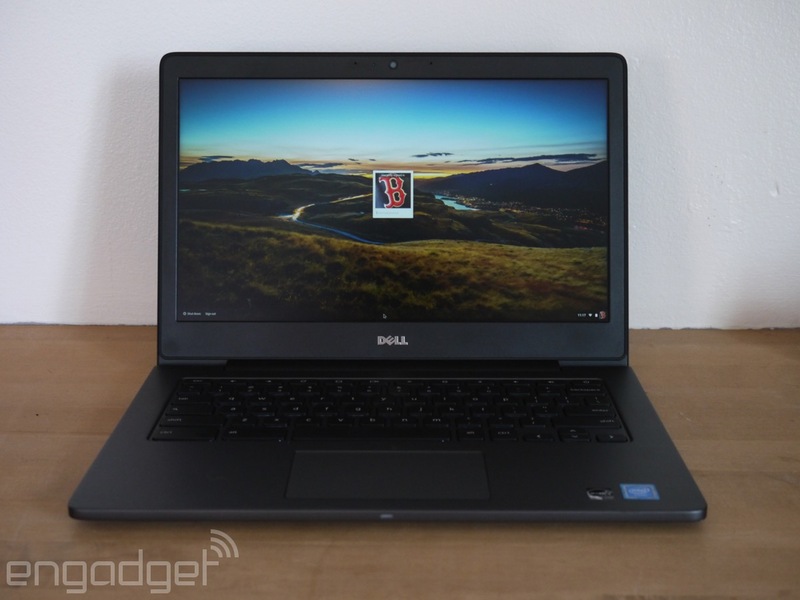 At $429, Dell's Chromebook 13 is in a class of its own. As I've mentioned, most other Chromebooks out there can't really compete on fit and finish, display quality, overall hardware or performance. There is one that can: Toshiba's newest Chromebook 2. Toshiba just updated the laptop with a newer Celeron CPU -- and it's selling for a full $100 less. And if you want more power, you can upgrade it to a Core i3 processor for the same $429 as Dell's Celeron model goes for. We haven't tested it yet, so the question of battery life remains; the original Toshiba Chromebook 2 lagged behind a lot of the competition in that department. The Dell model also feels like a more solid piece of hardware, although Toshiba's screen is probably the better of the two. I'm partial to the great keyboard and insane battery life of the Dell, but your mileage may vary. 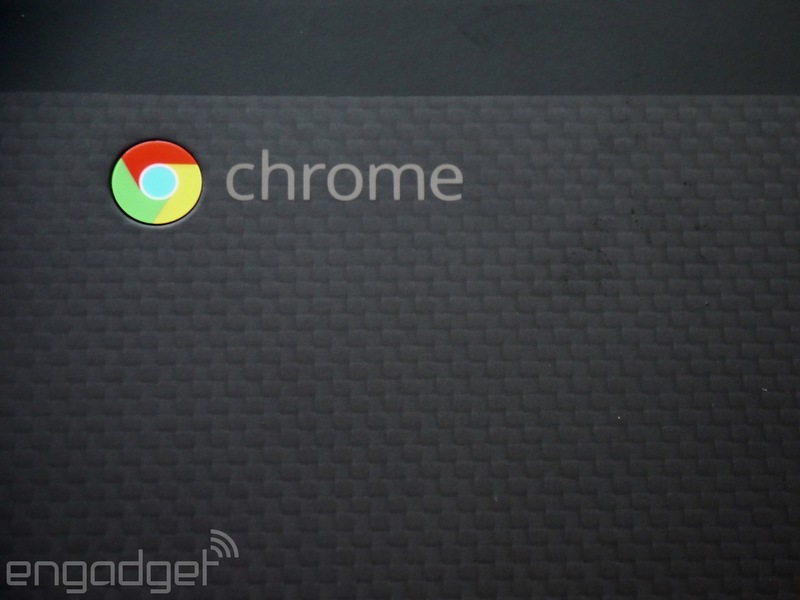 It's a good time to be in the market for a Chromebook. That's because laptops like Dell's newest model go a long way toward dispelling the notion that Chromebooks are cheap, compromised machines that don't have the hardware or software to cut it as your main computer. Chrome OS will likely always lack some features or applications that Windows or Mac options offer -- but for a lot of people, living life in the browser is becoming more and more viable every day. Until recently, finding good Chrome OS hardware has been as hard (or harder) than finding a good web-based workflow -- but Dell's Chromebook 13 raises the bar on how good a relatively inexpensive computer can be. Yes, it costs more than most other options out there, but you get a lot for your money. If you're on a tight budget, Toshiba's Chromebook 2 is probably a better option, but for my money, the Dell is the best Chromebook I've used. There's just no compromise to speak of here, and as such it's an easy laptop to recommend to anyone who might want to make a Chromebook their main computer. That may have been a crazy idea just a few years ago, but it's not anymore.